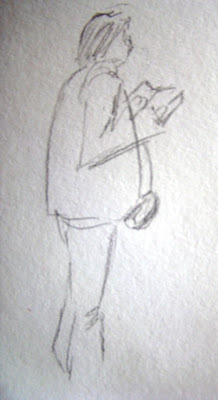 I drew this super-quick sketch at a table sale, which I went to with Mum. It was at the point where a women stood at the book stall almost directly in front of me, seemingly engrossed in the book she had selected, when I thought, if I don't do it now I will once again go home with a clean page. So, I opened my sketchbook and began scribbling. I knew that however engrossed the woman seemed, she could walk away at any moment, and I think this feeling of panic helped, because after just a couple of minutes, my clean page was now sporting a sketch of a woman, clearly browsing through a book . She moved on before I had the chance to add or adjust anything, and actually, I like it just as it is. It was funny, really. I was worried somebody would realise what I was doing - but instead, the only person to pay me any attention at all was a lady who tried to give me her 50p entrance fee!